Es Far Cultural (The Cultural Lighthouse) with the #Coompromis2020. 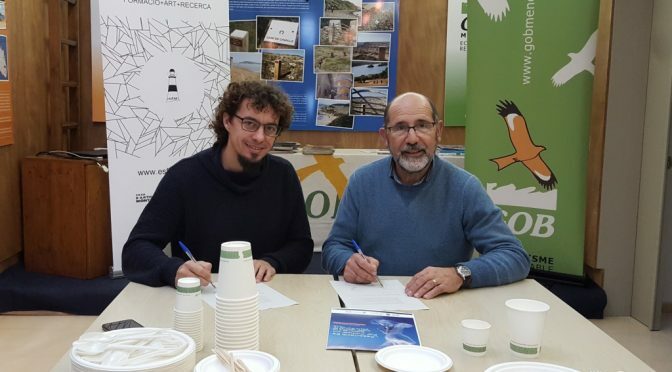 This cultural association in Mercadal has already, and for some time, been using reusable ceramic and glass for their tableware at celebrations, but, even so, they wanted to sign the agreement showing their concerns for the problems of waste plastics in the sea. Each year more than a million birds, a hundred thousand marine mammals and turtles die because of the waste which enters our seas. The latest studies have found more than 170 marine species have plastics in their bodies. The animals do not distinguish plastic from some foods in their diet. A common case is that of the marine turtles that often ingest plastic bags or plastic cups thinking they are jelly fish. Once they have entered the body the plastics cause intestinal obstructions and the turtles usually die. To confront this plastics epidemic, GOB is continuing with a campaign for public organisations which proposes to change current habits of utilising one use plastics. These objects with a short useful life and because they are so light, easily end up in the sea resulting from heavy rain or from being blown in by the wind. If we take as an example the expendable tableware used in fiestas and celebrations, better alternatives are drinking vessels, plates and cutlery made from reusable materials. However, in those cases where this is not practical then there are biodegradable disposable products. A multiple agreement with the Menorca Preservation Fund, the Marilles Foundation, the Sunseeker Company and the Blue Marine Foundation has allowed GOB to give biodegradable tableware to those associations that have enlisted to make a change for their fiestas. This tableware is made from the cellulose of sugar cane, cardboard, wood and corn starch. Es Far Cultural has decided to be included in this initiative. We encourage groups and associations who organise periodic fiestas to be included in the campaign against expendable waste, so that by 2020 there will be hardly anyone using plastic short term products giving a large environmental problem. You can see the groups enlisted to the campaign by clicking here.